Isn’t it crazy how you can read a Bible passage several times and then one time it suddenly speaks to you? Not just whispers, but actually roars? Lately I’ve been camping out along with Moses and the Israelites as they contemplated entering Canaan (Num 13-14). God promised this land to them. Actually led them to it and gave them a green light. Moses sent a posse of twelve to spy out the land and report back. Only two of the twelve recommended that they move forward. Really? God promised. God delivered. God was with them, but they refused to go? Mind boggling! Ask God to lead. I cannot imagine traveling this life journey without Him. Research. Moses picked one leader from each tribe to explore Canaan. The scouts were tasked with finding out how many people occupied the land, how strong the people were, security measures, whether the land was fertile and the types of crops grown there. Report. Ten scouts voted no, afraid of the giants that lived in the land. Caleb and Joshua voted yes, confident that God would keep His promise. Evaluate. 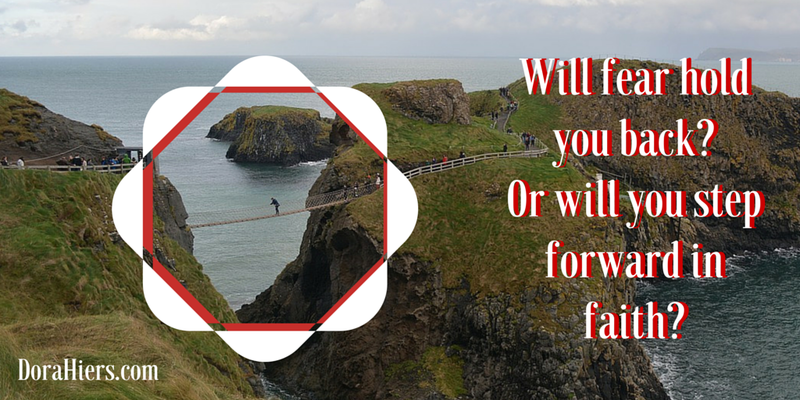 Will fear hold you back or will you step forward in faith? Decide. Focus forward, on the blessings that await, not on your past. Act with confidence, and stamp out negativity. Ten men influenced the entire camp, and they all paid the price. Accept consequences. Because of their lack of faith, God banished the Israelites to wander the wilderness for 40 years. Only Caleb and Joshua would actually enter the land that God intended all of them to enjoy. Lord, forgive me when I don’t step out in faith, when I turn and hide. Help me choose obedience and blessings over doubt and fear because You are so worthy of my trust. Amen.